Ready for all things beauty and fashion? 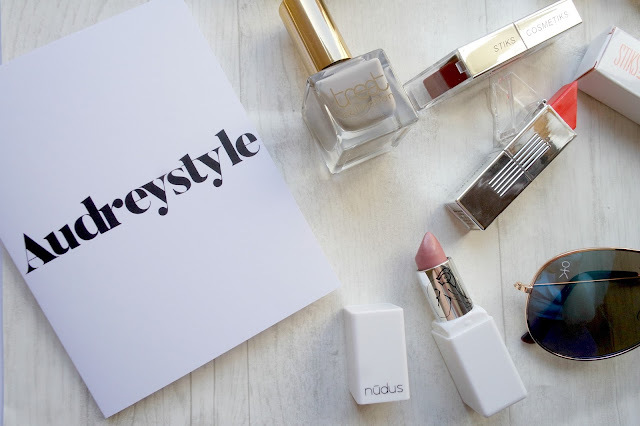 Then look no further - I have a little haul from Audreystyle! When the email popped into my inbox asking if I wanted to try some of the products available from Audreystyle my fingers couldn't type 'yes yes yes' quick enough. I have been a fan of Audreystyle since I came across them on instagram. 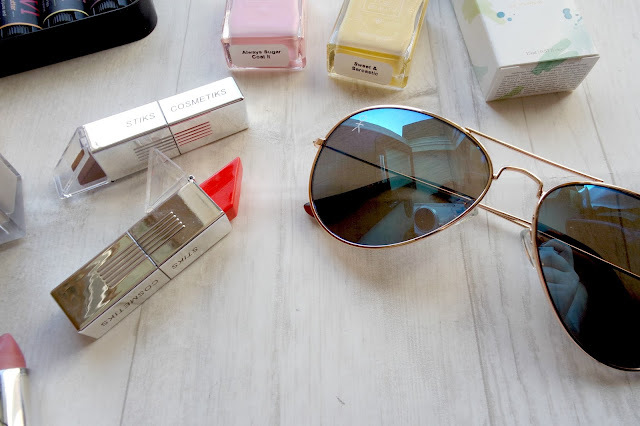 They are an online uk boutique that have selected high end products, both beauty and lifestyle from elite brands such as Girlactik, Trust Fund Beauty and many many more. The first thing that jumped out to me were these gorgeous Jetsetter Aviator sunglasses from Dicks Cottons. They are have this beautiful light blue mirror effect and such a delicate gold frame - I love them! I'm not normally one for sunglasses - I tend to just awkwardly squint in the sunlight but I have been taking these every day with me in my handbag. They are great quality and are a perfect fit! I am a huge nail varnish fan, I never not have on so when I saw that there wasn't just one but three polishes in the box I was super excited. The first two that caught my eye are these two beauties from Trust Fund Beauty! I have seen a few reviews on these varnishes and have already had both colours on my nails. The first is this cute baby pink in the shade 'Alway sugar coat it' - the shade names are amazing and so unique. The other is a nice pale yellow in the shade 'Sweet and Sarcastic' - oh so sassy. These polishes are great with two coats and dry super fast which is what I always look for. The third polish is from Treat Cosmetics and the colour is so me - I call it grey-ge (grey ash beige) but the shade is actually called 'French Vanilla'. I have this on right now and I've had so many compliments on it. It's good with one coat but two coats brings out its full potential. I don't think this polish is in stock right now on the website but there are so many great colours, one of my favourite being a stunning light blue in the shade moonlight. 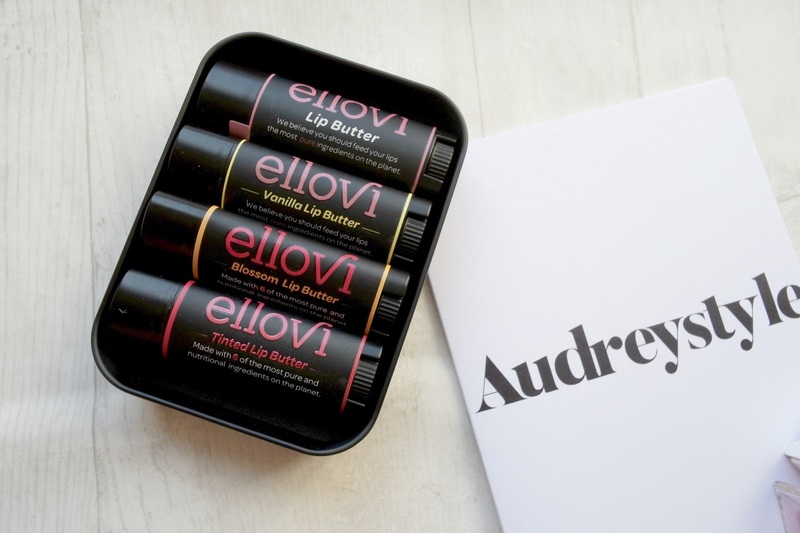 Next up is the Ellovi lip balm collection. These lip balms are amazingly hydrating and in this collection you get all four options, Original, Vanilla, Blossom and a tinted balm. They all smell incredible, especially the vanilla (it smells good enough to eat). I have been under the weather recently and normally my lips go really dry but with the help of these bad boys they are looking fab. Now when I opened the box is was hut with a glorious small and this is where it was coming from, the Lab Room's French Rose candle. Oh my goodness - even when it's not lit it makes your room smell amazing but once lit - it was like I was transported to the flower fields in France! The burn time for this candle is 45 hours which is incredibly impressive - I want all of them! Last but certainly not last is the lipsticks that I received, two Stiks Cosmetics and one from Nudus Cosmetics. Just look at these two lipsticks from Stiks Cosmetics! First of all I have never seen a lipstick with such great packaging - to reveal the lipstick you twist the bottom half of the slick silver case. I got two super pigmented colours, Red and Tangerine. The red is the perfect deep red for a brunette and is going to be my go to for Autumn I just know it and the Tangerine is nothing like I have even worn before and I'm in love with it. These lipsticks are hydrating, long lasting and again super pigmented! I just can't get enough. The Nudus lipstick is in the shade Halo and it's a lovely delicate pink - a 'your lips but better' shade. In this lipstick there are 27 organic ingredients and is topped of with a hint of frost. It's great as an every day shade and all of the Nudus lipsticks are cruelty and gluten free! Thank you so much to the team at Audreystyle for hooking me up with some amazing products! If you like what you see be sure to have a look on their website!